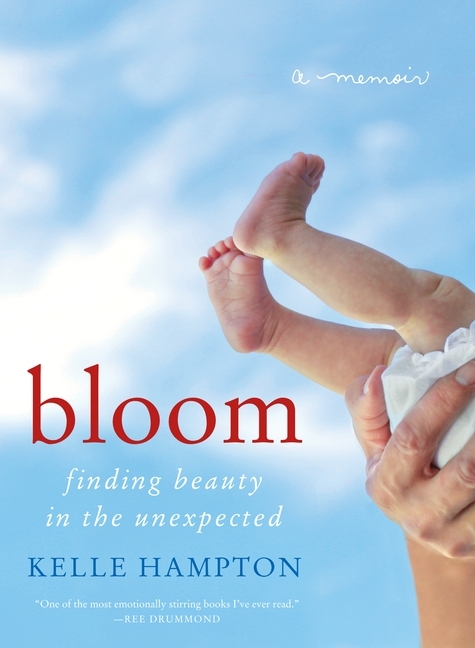 Bloom : Finding Beauty in the Unexpected and I knew I'd simply have to read it. It sounded fabulous. Kelle Hampton was happily (and extremely excitedly) awaiting the birth of her second daughter, Nella, when she birthed a very big surprise. Nella was born with Down Syndrome. This came as a shock to Kelle and her husband. Kelle was quite devastated. In this book she expresses her very raw emotions and painful introduction to her beautiful baby girl. Eventually she comes to understand that Nella is indeed perfect and their family was quite blessed to welcome her into it. Bloom is definitely not for the faint of heart. Kelle is honest and I can understand why such honesty would be applauded. She did not react well to Nella's birth and she takes no pains to mask her true feelings. I can also see and understand the arguments that this is a harsh book because Kelle spells out how difficult it was to have Nella placed in her arms, knowing that Nella was so very different. Kelle did not have pretty emotions. Nella did not bring her the joy and happiness she had anticipated for so long. There is no misunderstanding Kelle's emotions as she makes herself very clear. She also, however, expresses sadness over her own feelings immediately post-birth. She feels sorry for her earlier self, the Kelle who birthed Nella, because she has now grown to know that Down Syndrome is a beautiful thing and that Nella is no less a person because she has it. Still, it is a difficult story to read. I found Bloom to be utterly fascinating for a few particular reasons. #1 - I am a mother. It is difficult to wrap one's mind around the idea of not welcoming a child into the family with sorrow attached. Being of the firm opinion that God is the giver and sustainer of life, and therefore it must be supported and defended in any form and at any time, I am met with the instance desire to thank Him for the life, even if it is confusing. None of my children have Down Syndrome and so you might say that I'm only left to imagine my feelings upon discovering that my child is different than many others around them. #2 - However, I'm not totally left to my imaginations. Our second born son is adopted from South Korea. All throughout the book Kelle mentioned Nella's "almond eyes" as a point of reference to what made her so different. My son has almond eyes by nature and so every time she described Nella's eyes, I thought of Bookworm2. He's very different from us and almost everyone we know. He has been a great learning curve, not so much in that we weren't expecting him to be different, but that in actuality there are many things about his past that we do not know. He is, in some ways, a question mark. While I can identify shared behavioral and physical traits in my biological children, they are not as easy to point out in Bookworm2. His differences were expected, but some of the conditions surrounding his joining our family threw us for such a loop that we had a very difficult time transitioning. In this respect, I could sympathize with Kelle's struggles to adapt to something that she didn't expect. She does learn fairly quickly that Nella is exactly who Nella is supposed to be, and that their family is blessed. #3 - Kelle and I part ways in the manner in which we accept the change that came into our homes and families. Kelle spends a great deal of time explaining why it is that she believes that God could not have allowed Nella to be the way that she is and that He only means goodness and kindness always. She can't explain Nella but she goes to great pains to explain that God is only love and means for nice things to happen. Basically, she accepts God when she likes the way that life is going and she doesn't accept Him in the hard times. That which she does accept about Him, she defines in her own terms. I disagree with her theologically as she avoids finding answers in Christ. My answers are in Christ. I believe that God is good all of the time, yes. But His good doesn't always make me comfortable. Sometimes it's quite the opposite! Bookworm2 joining our family has been very, very good. That did not, however, translate into his being very, very easy. God had some things to work out in myself and in our family and He chose to use those circumstances to rock our world and cause us to depend on Him more. God is always working out things for my good and for His glory. This I trust and this I know to be true, for He is sovereign and His promise is to complete the work that He started in me. Things will happen in my life that I might initially perceive as evil. Let's face it -- I don't like everything that comes my way! But just because I do not like something or perhaps do not understand it does not mean that God fell off His throne and/or made a mistake. It just means I am a finite being who cannot see the big picture of what God is doing. I must only trust that He is at work. If I do, then no matter what happens I can say, "The Lord giveth and the Lord taketh away. Blessed be the name of the Lord!" That blessing of the Lord's name no matter the circumstances also is applied to situations where my own personal dreams are being sifted and re-shaped. #4 - I am pro-life. In any form. At any time. The above mentioned things made this read an intriguing one to me and for those reasons I heartily recommend it. I think it would provide great conversation in a book club. The conservative reader should be put on notice that there is a lot of foul language in Bloom . A lot. Kelle is also quite the party gal and shares one particular example of a drunken "night out on the town" which is a bit off-putting to myself. Drinking with friends is a prevelent theme throughout the book and so if you do decide to pick up a copy of the book, be aware that you'll have to ignore a good bit of her personal behavior to get through to Nella's story. Do I think it's worth it? Ultimately, yes. It's a thought-provoking book in many ways and with those disclaimers, I cautiously recommend it. Thanks to William Morrow for allowing me the opportunity to read Bloom (which I devoured in two days, by the way!) All thoughts and opinions expressed above are entirely my own. Well, her response certainly sounds better than that of the couple who sued the ultrasound people when they failed to catch the Down Syndrome in their child. Apparently lawsuits are not rare. I remember the technician being very clear that just because they didn't observe something didn't mean that something couldn't be wrong. I haven't read this book. But I loved your thoughts on it! And to your pro-life in any form at any time, I say a hearty and resounding AMEN! Part of the ultimate beauty of God's True love is that EVERY single human is important and no one is indispensable! We are all unique for a reason and God's plan is good! I love that God throws we humans off track by sending us people in our lives that cannot fit in our neat little molds. The people born with Down Syndrome or a form of Autism are beautiful examples that we know very little about how our brains and bodies work but God understands and it is to His glory that all live! Love to you and your boys and girl! I suppose the simplest way that I can express my belief about God's will, which does not seem to fit the Reformed concept of sovereignty, comes from the Lord's prayer. "Thy kingdom king, thy will be done, on earth as it is in heaven." I think the Reformed concept of God's sovereignty is much closer to God's heavenly will. We wouldn't need to pray that line of the Lord's prayer if God were already doing His will on earth as He is in heaven. Daniel 10 is probably the best example of this view. About #1. I have several friends with special needs babies - Cerebral Palsy, Cystic Fibrosis, Down Syndrome... I think I relate to how you can value life but at the same time feel sorrow over the birth of your special needs child. It's grieving over the loss of your hopes, dreams and expectations. Adjusting to a reality different from what you expected takes time. But each one of those babies are valuable! I've learned a lot by watching my friends adjust to their new "normal." One friend said, "No one wants to win the "worst life" contest." That really changed my perspective. Taia, I'm not quite sure why you brought up God's will, or Daniel 10. Are you saying that God didn't plan for certain people to be born differently? If you would explain further I am interested. God's will is perfect in Heaven because there is no sin there but it is still being worked out on earth, if earth were as glorious as Heaven we wouldn't need Heaven! The will of God is perfecting His plan for His people on earth until all His enemies have been brought to their knees and every human on earth bows to His sovereignty. We, as Christians, work out His eternal purpose on earth by believing and behaving in specific ways according to His instructions in Scripture. It certainly is hard to imagine how I would react to such a surprise. As a fellow "pro-lifer in any form at any time", I would think I would praise God for my child's life. At the same time, I can see what Stephanie is saying as far as *grieving* the "loss of expectation". We are so finite, aren't we?! We just don't always see things the way God sees them. What we might perceive as "bad" and have a hard time reconciling with God's goodness and love. . .well, that might be exactly what the Lord is using to SHOW us just how incredibly good and loving He is. We are the ones who need to redefine how we see things. I hope that makes some sense--it does in my own mind. I can definitely see this book as a good discussion starter! My husband's older brother had Down Syndrome. He lived to be an adult, but he died before dh and I met. Knowing how very much he was loved by his entire family would definitely color how I would read this book, I think, but then again I also think I can relate to a feeling of disappointment or disillusionment when things don't go exactly as we expect them to. It seems to me that the healthiest lives/families are the ones that get through that part of the grieving process and see the individual as someone God is using for His purpose in this world, but that also requires a certain understanding of the world or a certain amount of faith, doesn't it? @ All and anyone - I definitely can see the need to grieve when an expectation is dashed. I hoped I was communicating that. I can understand the need to grieve most definitely. What I'm saying is that even my personal dreams and expectations must needs be corrected and reshaped. It's important to dream and proper to expect certain things. But ultimately, I must learn to surrender even my hopes and dreams to a God who knows far better than I about what is most beneficial to me. That's "all" I'm trying to say. I appreciate what you just posted, Carrie. I like how you put it; "I must learn to surrender even my hopes and dreams to a God who knows far better than I about what is most beneficial to me" The hope in God's plan is part of the journey to becoming closer to God. It doesn't mean we don't deal with disappointments, heartaches and distrust but it does keep pointing us towards God's working in our lives when we stumble! Every time we surrender part of our life to Him we grow a little closer to His plan for us, which is for "a future and a hope". This is the difference between the way the Christian should react to grief and disappointment and the way the rest of the world does. Hope. If it wasn't for the language and all, I'd love to read this book! My 15 month old nephew has Down Syndrome. He is PRECIOUS and such a BLESSING! My brother and sister-in-law knew about it before he was born, so they had time to soak it in before meeting him. It's been very hard and challenging for them, even though they love him and accept him. They don't exactly have the same beliefs as me, so I'm proud of them for their choices. Two of my cousins have severely disabled children. (More disabled than Down's children. )The medical bills are enormous- it's not just a matter of being born different. How does a family (even an extended, supportive Christian family like mine) manage 5 or 6 digit annual medical bills and an uninsurable, at least in many states, child? I've read that 80% of marriages in such situations end in divorce. It prevented my cousins from having other children. So far my cousins are holding on in their marriages, but the practicalities of severely disabled children are enormous. If man had not sinned in Eden, I don't think babies would be born severely disabled. I think severe disability and its associated suffering is part of the havoc sin wreaked on the world. The Daniel 10 reference is to the angel who was delayed by spiritual warfare in responding immediately to Daniel's prayer, evidence that God's will is often at least temporarily thwarted. And on a practical level, I wish more people with "any life, any time" views would adopt and pay 6 figure medical bills for severely disabled babies, or even pay 5 digits for the people who have them. We helped with expenses during my father-in-law's long battle with cancer, and I decided my attitude toward paying medical bills for people with disabilities is "I will not offer to God that which costs me nothing." He died, in part, because of the costs and low probability of treatment success. I'm OK with that. I will honor God with what I can pay, but not profess "any life, any time" views. Book club you say? I would be up for this one. And can I just say I love the cover of this?! Baby feet are the best! It sounds like a challenging/fascinating/rough/good read to me. I am sorry for your father-in-laws death and the struggles of your cousins. Your family has truly seen some adversity. I am glad you posted again so that I could understand more of where you are coming from. The fact that many families with handicapped children struggle financially is a breakdown of God's people on earth helping each other, not a breakdown of God's will. We should be helping those people. You are right, the same goes for adopting severely handicapped children. And I know of many Christian families who do take children like that into their hearts and homes. I agree that the Fall of Man (and Woman) is where everything fell apart! Being human now equals Sin, Pain and Death. But if we as society decide that handicapped people are not worth having around then we are opting for selective elimination, or as I call it, murder. And once we decide that it is fine and dandy to kill off certain people based on group specifications, then what is to stop us from going even further into specified humanity? Either all human life is sacred or no one is. From a Biblical worldview we see in Genesis 9:5-6 that humans carry the image of God and are so valuable that God requires nothing less than the life of the murderer. Daniel 4:34-35 says that God acts according to His will in the army of heaven and among the inhabitants of earth, that "no one can restrain Him". For if God's will can be temporarily thwarted why should we believe that He is God? Three qualities of God are that He is omnipotent - He can do anything, omniscient - He knows everything and omnipresent - He is everywhere. So either His divine sovereignty is unquestionable or He can be thwarted and is nothing better than a genii in a bottle who sometimes grants us wishes but is powerless to help. I Cor 15:20-28 emphasizes our freedom in Christ, His active reign and His total control over "all things". Adam and Eve brought Sin, Pain and Death into the world, Jesus brings Forgiveness, Peace and Life. Again and again Jesus and the Word emphasize the importance of showing God's love to all. I John 3:16-19 We are called to outwork God's love for us in deed and truth, actively! I John 4:7-9 Again, we are called to love one another. I John 4:17 When renewed by God we become more like Christ in our sharp contrast to the world around us. As Christians we must have hope. Daniel 6:23 "Then the king was exceedingly glad, and commanded that Daniel be taken up out of the den. So Daniel was taken up out of the den, and no kind of harm was found on him, because he had trusted in his God. " Matthew Henry said, ".. Daniel was kept perfectly safe, because he believed in his God. Those who boldly and cheerfully trust in God to protect them in the way of duty, shall always find Him a present help. Thus the righteous is delivered out of trouble, and the wicked cometh in his stead. The short triumph of the wicked will end in their ruin. If we live in the fear of God, and walk according to that rule, peace shall be upon us. The kingdom, the power, and the glory, for ever, are the Lord's; ..."
I see your point. Quite simply, I am not God. I am a human creature with human limits, both personal and financial. God can love people with physical challenges equally well dead or alive, so extensive medical treatment may or may not be part of His will. I don't think any of us are advocating killing severely disabled people. I just don't think we can afford to do everything for everyone. I don't think lack of funds for extreme care (my father-in-law's care was ~$800,000) reflects a failure of God's people to reflect His will. It reflects a choice about living within the limits God has given us. I think too many Christians don't want to acknowledge those limits. Fifty years ago, my cousin's babies would have died at birth, and people would have said it was God's will. I don't claim to know what God's will is in situations like those. It's so sad that some people think babies with Down's syndrome aren't worthy of life just because they're different. Hopefully this book will help to dispel that notion. I agree about the mistaken theology that hard things in our life aren't from God. People who believe that are missing great chunks of their Bible. And I agree about being pro-life 100%.